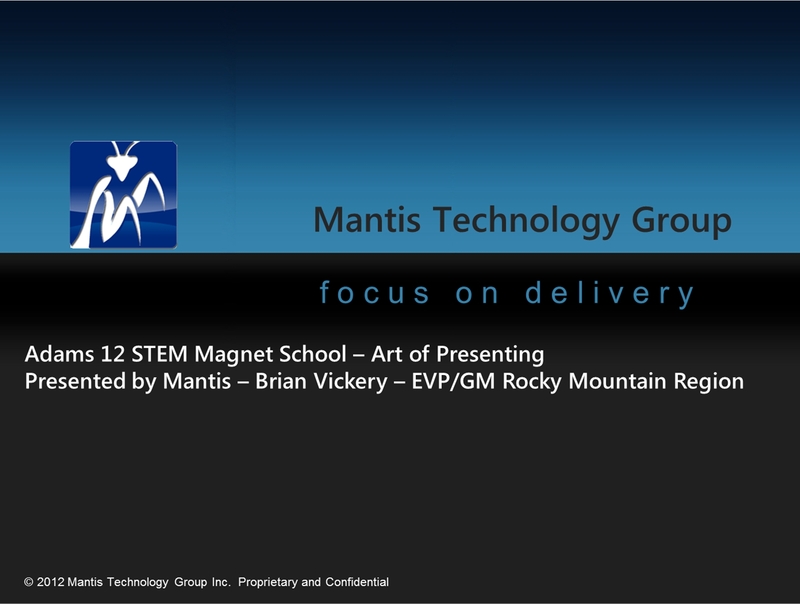 I just wrapped up yet another rewarding experience with the Adams 12 STEM Magnet Lab school in Northglenn, Colorado. I get excited about what these educators are doing every time I set foot in their classrooms. The teachers are excited about their jobs, and the students have an astounding capacity to pay attention yet still be inquisitive. For the third year in a row, I presented the topic “The Art of Presenting”. These STEM educators understand the importance of teaching our students Science, Technology, Engineering and Math. However, they also instruct the students to develop strong communication skills. If they cannot communicate their innovative ideas, how can they change the world into a better place? Nobody will understand them! I took a video of the presentation, and I uploaded it to YouTube. It is a long session (about 58 minutes), but I posted it with the hopes it would help other educators. In order to get to a reasonable file size, I did have to forego some of the video quality (which was originally shot in high-definition). Besides posting for educators, I want to again make an appeal to other business leaders to consider supporting their schools. These students are the next generation of business and world leaders. Their ideas will drive new discoveries. Your help – whether it is as a guest instructor or “expert panelist” – can make the difference independently of any education budget shortfalls. Choose to make a difference – you will not be sorry, and you may find yourself blessed by the outcomes! If you can simplify your message enough to communicate to a group of 5th graders, you’re 90% of the way there. Well done! Thanks, Doug – upon review, I heard myself using a few words that were a little too-big for a 5th grade class. I did have a kid ask me what invigorate meant. But you know I love active and energetic verbs and adjectives! I also take for granted these kids’ comprehension level. It is truly an exceptional learning environment, and STEM schools are very receptive to business leaders that want to help out. “The teachers are excited about their jobs, and the students have an astounding capacity to pay attention yet still be inquisitive.” That must be a great school! In Toronto, the teachers just want to go home as soon as possible and the students hate “education”. Thanks for stopping by, Tony. Oh, you get that here in the US, also. I also do not want to give just the STEM educators the limelight regarding their passions for education. I know my daughters, where the youngest is wrapping up her education in the public school system, have had excellent and engaged educators at the Advanced Placement (AP) level. Excellent post. It’s refreshing to hear about a school that supports the notion of effective communication, especially public speaking, for all students. It’s a skill that will benefit them throughout life. Being excited about your topic is half the battle—being able to share that excitement with others is what captivates everyone else. I completely agree, Stephen. I remember when the STEM Launch school did their ribbon cutting ceremony this year, and one of the STEM Magnet kids came and did a ceremonial “passing of the lab jacket”. I was very impressed with his public speaking in front of a crowd of VIPs. Those educators are doing a fine job with these kids. I would love to see that same enthusiasm, and creative approach to teaching, scale to other public schools. I think industry volunteers could help inject enthusiasm while keeping the educators in touch with what is happening in industry.